Your nylons are so cute! I really like your kitty socks! What a unique way to wear pumps! Love the pumps and the long socks too. Also, who doesn't like cats! love the lace pumps..... your OOTD is so cute!! I LOVE the shoes! They're lovely! Happy Holidays! Nice post dear. Followed you, hope you will do the same. Estas muy bella!! me encanta todo tu atuendo... eres una chica muy hermosa!! Cute outfit, love the pumps! ^__^ Merry Christmas! Wow! You look so pretty!!! The shoes are so nice! Happy Christmas!!! Such interesting tights! Merry Christmas! I love the tights! So cute! Love the leggings and those heels are amazing! Happy Holidays love! Cute outfit ! ^^ I love the tights and shoes! Your shoes are the most cutest ^^ I love them so much!! Can we follow each other via gfc/bloglovin? Oh dear I love black cats too they are so very poise and just beautiful! Major crush on your shoes and stocking! You look so pretty on these pictures! Those tights are adorable, Merry Christmas! 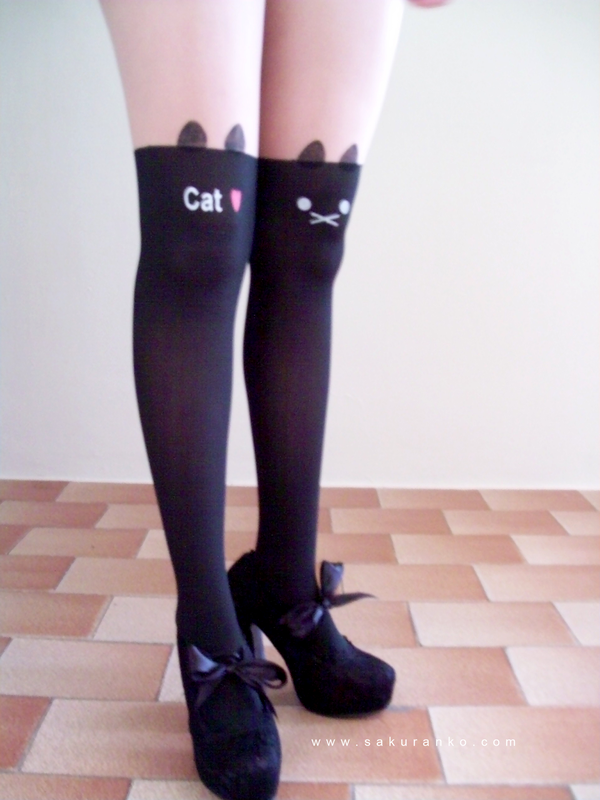 Adorable tights, this is too cute! Thanks for stopping by my blog--I followed you on GFC and Bloglovin! You look so cool and lovely! cute outfit! those tights look like my hello kitty tights hehe love it! Perfect pumps!!! you look so choc! Pretty tights!! I wish you happy Holidays dear! Adorable outfit sweetie, your tights are very cute. the cutest tights i've ever seen! MEOW! love this outfit, so chic and adorable! Wow those shoes are super cute! And I love your tights!